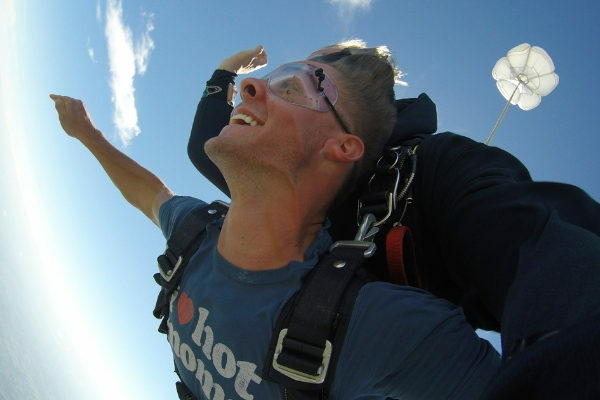 Chances are you are not exactly immersed in the world of skydiving, and that is okay! Everybody has their niche, and this is ours. If you are new to the Georgia area or just curious about skydiving in Georgia, we have you covered. Here’s everything you need to know about skydiving in Ga.
We are dedicated to safety! The United States Parachute Association, USPA as we call it, is a safety trendsetter. A while back, the USPA established the Group Member Program as a way to get drop zones, skydiving schools, clubs, and centers all on the same page and with uniform safety standards. When you begin looking for a skydiving center in GA, make note that we are a USPA Group Member: we have pledged to comply with the USPA’s Basic Safety Requirements, have employed staff that are current USPA instructors, use USPA approved gear, and USPA developed instruction methods. As a USPA affiliate, Skydive Monroe is a drop zone that is committed to safety. A tandem skydive is one of the best ways to begin skydiving in Georgia. A tandem skydive is a type of skydiving where you are in a harness and attached to a USPA licensed tandem instructor. This instructor is there to be your personal, knowledgeable, extreme tour guide through the skydive! They assist you with freefall, deploying the parachute, piloting the canopy and landing. 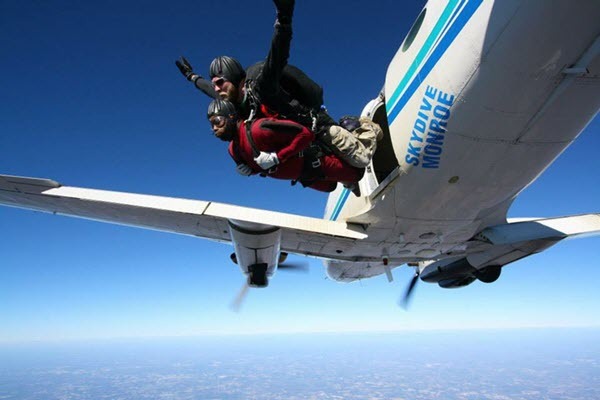 When you begin planning to make that first tandem skydive in GA, plan to spend about half a day at the drop zone, and make sure you wear comfortable clothing and athletic shoes. BONUS: If you choose to make your first GA skydive at Skydive Monroe, we provide a jumpsuit and headgear to protect your clothes from wear and tear. Double the fun and bring your friends! At Skydive Monroe, we offer some pretty sweet group rates, so you can share this experience with all your pals! If you wrangle up five of your bravest buddies, the rate is $160 a person. So, you get to save some precious dinero, and share one of the most amazing moments of your life with the ones you care about. It doesn’t get much better than that. Well, maybe it could get better than that. If only you were able to have a picture of the tough guy of the group when his face was painted with sheer terror upon exiting the plane…and, guess what? You can! Skydiving in Georgia is a big deal. If you are going to make the leap, make sure you capture it all on film. At Skydive Monroe, we have several video packages for you to choose from: Handcam Video, Handcam Video and Still Photography, or Outside Video and Digital Stills, which are captured by your own separate videographer! Getting a skydive on film is a lot like the saying “if a tree falls in the woods and no one is around it, does it make a sound.” If there’s no proof you went skydiving, did it even really happen? When you begin planning your skydiving trip in Georgia, make sure you choose a drop zone with a prime location! Skydive Monroe is only a short drive from the University of Georgia in Athens and only 40 miles East of Atlanta. To get the most out of the skydiving experience, don’t rush it. Book your reservation ahead of time and plan to make a day of it! Our other suggestion is to schedule for earlier in the day. It’s the summer now, so it is pretty toasty later in the afternoons. Beat the heat and schedule a skydive for the morning. If you can’t make a morning time work, don’t fret. The brisk, chill feel of altitude will help you cool off on even the most sweltering of days. If you are paying for the experience of a lifetime, get the experience of a lifetime! Why ride to an altitude at a snail’s pace in a cramped cab when you can ride with style. At Skydive Monroe, we’re lucky to have one of the fastest fleets around, and it is all thanks to a turbine engine aircraft called a King Air. This zippy jump ship can seat 14 and makes it to 14,000 feet in under ten minutes. We know your time is valuable, so we try to get you where you are going post haste! Feeling confident about skydiving in Georgia, visit Skydive Monroe, we would love to share the experience of a lifetime with you!